Comedian Steven Wright said there is a thin line between fishing and standing on the shore looking like an idiot, and I suppose that is sometimes the case. Of course, some of us might be better at looking like an idiot than others. And though I will name no names, we also must note everybody’s good at something… and I guess that includes looking silly, right? 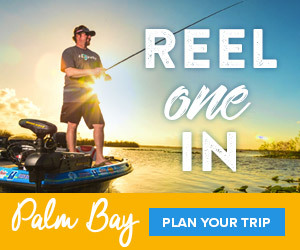 But seriously, you can bet your bass boat there is definitely always a line between an angler and his quarry, and you can double you bet and throw in the outboard that this line a very important connection. Perhaps it is this requirement, having a reliable connection between angler and fish that has today’s market so knotted with lines. And it’s true that be it mono, braid or fluorocarbon, all lines have a place in your arsenal. Simply put, various fishing applications or techniques call for various characteristics in a line. That said, what’s my line? Well, actually it depends on the water I am fishing or the tactics the day requires. But when it comes to fishing clear water, my line has got to be fluorocarbon because it really does vanish. And in recent months, while filming some saltwater shows, the attributes of fluorocarbon line have become clearly obvious. In saltwater, you can see 20-30 feet or more, it’s that clear, so line visibility is a factor and for me this need for line concealment certainly carries over for freshwater fishing for bass. And there is no doubt today’s fluorocarbons are a different breed. In addition to the vanishing act, this fluorocarbon is dense and sinks faster, does not absorb water, it has incredible knot strength and abrasion resistance, and there is less stretch for a better hook-set. More and more anglers are recognizing these pluses. And many are doing as I have done—gone from using fluorocarbon primarily as a leader to loading my reels with it. (Its castability is great!) I use the 8-pound test on my Quantum spinning reels and 15-pound on my bait-casters. Next to braid, it is the second most sensitive of the line categories and you may not want to use it for topwater, since it sinks, but otherwise it’s awesome for nearly all-other clear water techniques. Still, all the pluses make it an awesome clear-water line, and I am more pleased with it than a big ol’ bass in a school of shad.